CRA issues T4A printing instructions • CRA stops paper tables • Possible ESA changes in B.C. • No changes to TD1MB in Manitoba • Possible minimum wage increase in Manitoba • MRQ announces retroactive changes affecting tuition • No changes to TD1NS in Nova Scotia • No changes to TD1PE in P.E.I. • Amendments to the Retail Business Holidays Act in P.E.I. The Canada Revenue Agency (CRA) is advising employers that downloaded the 2010 version of its T4A slip, Statement of Pension, Retirement, Annuity and Other Income, to not use the scaling option on their printer settings to print copies of the form. If the scaling option is used when printing the slips, the recipient’s social insurance number could be visible through the window in a standard envelope, it said. The Canada Revenue Agency (CRA) is no longer publishing a paper version of its Payroll Deductions Supplementary Tables (T4008). Effective with the Jan. 1, 2011, edition, the publication is only available online. 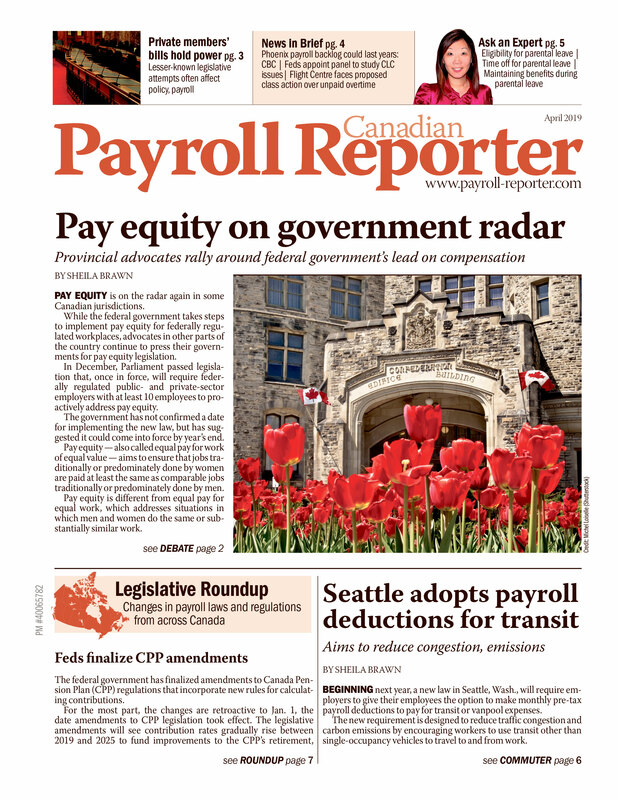 The CRA also notes this is the last year it will publish a paper version of the Payroll Deductions Tables (T4032). Beginning with the Jan. 1, 2012, edition, the T4032 will also only be available online. Payroll practitioners can save the online versions to a computer or print specific pages. The CRA encourages payroll practitioners to use its Payroll Deductions Online Calculator instead. •The role and purpose of the minimum wage, including how it should be established and adjusted. •Making the employment standards system more flexible for employers and employees. •Improving the way information on standards is disseminated to employers and workers. •Improving enforcement activities. •Ensuring complaints are dealt with more quickly. The ministry said the discussions would take place throughout the winter months. Manitoba family tax benefit: $2,065. The provincial government is proposing to raise the minimum wage rate to better assist young people and low-income workers. The government made the announcement in its recent Throne Speech opening the current legislative session. The speech did not specify how much the government would raise the minimum wage rate. It is currently $9.50 per hour. Any amounts paid as scholarships, bursaries or tuition fees related to post-secondary education for the family member of an employee are a taxable benefit to the family member, not the employee, Revenu Québec announced in Taxable Benefits guide (IN-253-V) for 2010 year-end reporting. The requirement is retroactive to 2008 and employers must report the fair market value of the benefit in box (O) of an RL-1 for the employee’s family member and not on the employee’s RL-1. Employers that reported these taxable benefits on the employee’s RL-1 after 2007 must file an amended RL-1 slip for the employee — amending boxes (A) and (L) — and a new RL-1 slip for the family member. The revised requirement also applies to educational institutions that offer free courses to family members of employees. The change does not affect scholarship, bursary or tuition fees for primary or secondary studies for an employee’s family member. They remain a taxable benefit to the employee and must be reported in boxes (A) and (L) of the employee’s RL-1.